Hello from way UP yonder in Colorado. In my 2008 New Year’s Day post I used the word intentions rather than resolutions and movement rather than exercise. One of my intentions is to be more active, spend more time outside, have more fun. I’ve spent too many hours sitting at my desk the past year and don’t want to repeat that in 2008 – I say as I sit smack-dab in front of my computer. Right now maybe, but Friday I was at Mary Jane Ski Area (Winter Park) having a great time following through on my intention. There’s nothing like blue skies, fresh powder, and a little altitude to elevate your mood, no pun intended. 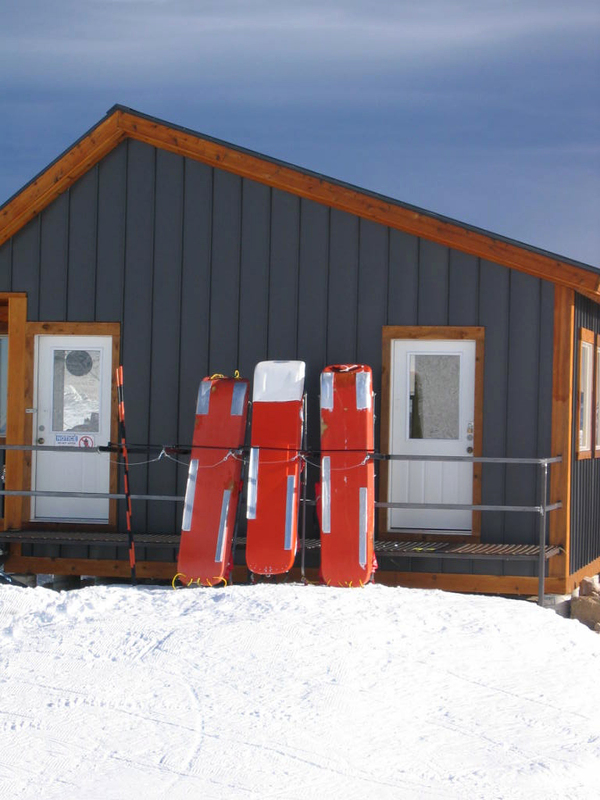 By the way, Mary Jane Ski Area was named after a real Mary Jane who had a thriving business going during the 1800s. Mary Jane lived in a little town called Arrow, which is now the base of the ski area. She was a lady of the evening and provided “friendship” to the miners, rail yard workers, and loggers during those long, cold, snowy winters the Colorado high country is famous for. She definitely understood the economics of supply and demand. 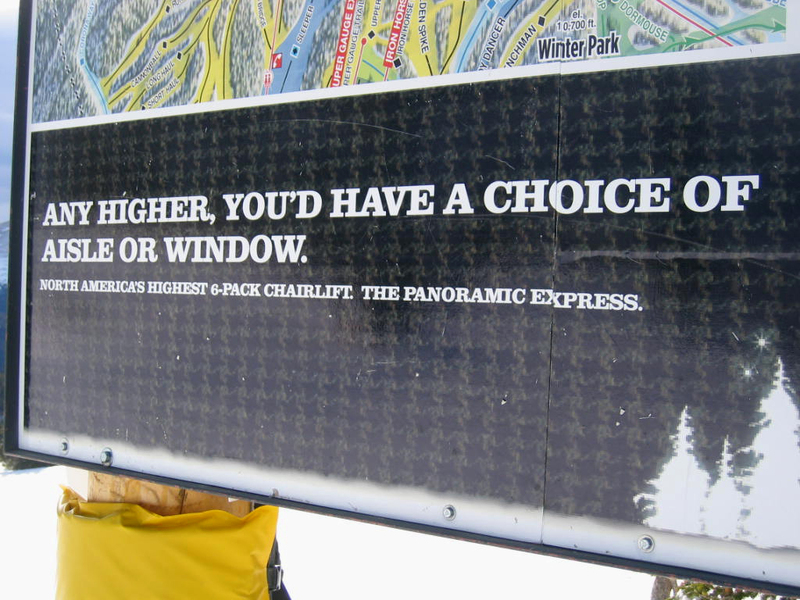 Mary Jane’s Panorama Express lift is the highest 6-person lift in North America (called a six-pack lift). It’s also powered by 100% wind energy credits which is pretty cool. This is a view of the continental divide from the top of the aptly named Panorama Express, which gives access to over 1,000 acres of skiable terrain. Yippee! The peak on the left is James Peak and on the right is Parry Peak. I’ve climbed James many times (even in winter), but not Parry. I’ll put that on my intentions list. 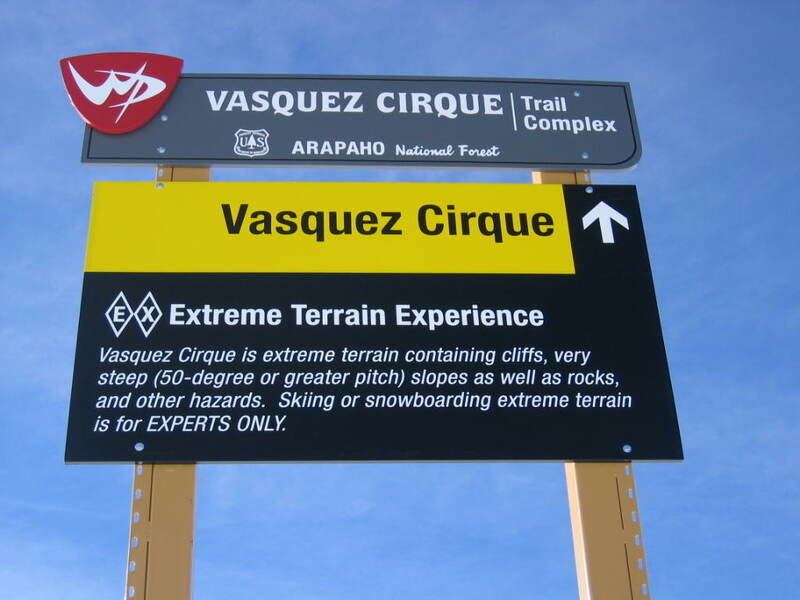 This sign sits at 12,060 feet. Fifty degree or greater pitch? Cliffs, rocks, and hazards? No hot chocolate with marshmallows? I’ll have to think about it. Whew . . . I mean, oh, darn. Name these tracks and I’ll send you a lovely door prize. Seriously, I’m not kidding. You might win something good – something that has to do with the great outdoors. Well? Give it a shot. One more view. Sorry I don’t have a better camera. Or photographic skills for that matter. Hopefully this National Geographic shot will give you enough information to guess which little high country critter left these tracks. 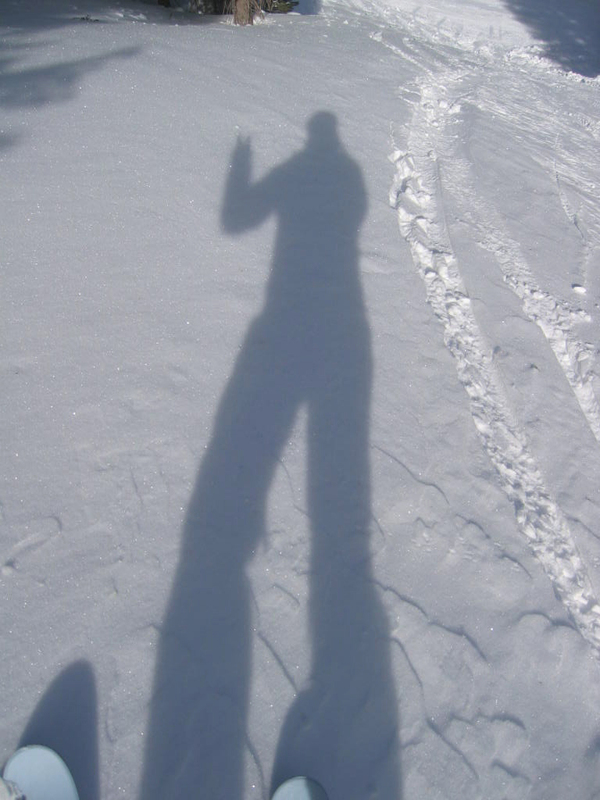 Peace to you in 2008! This entry was posted on Monday, January 7th, 2008 at 2:07 pm	and is filed under Adventure. You can follow any responses to this entry through the RSS 2.0 feed. You can leave a response, or trackback from your own site. Is it a snowshoe hare? Too fancy? Just a bunny? Hey Megan — you might win by default. Even if you’re wrong. I’ll give it a week and if I don’t hear from anyone else, you’ll be the winner of the consolation prize (don’t worry, no socks). Unfortunately, I can’t give you the grand prize, which “could” be a new dream home in Telluride. Oh well, maybe next time. All I can say is that I certainly do miss those mountains. Maybe when I get back in February I can take an extra day off and go skiing. 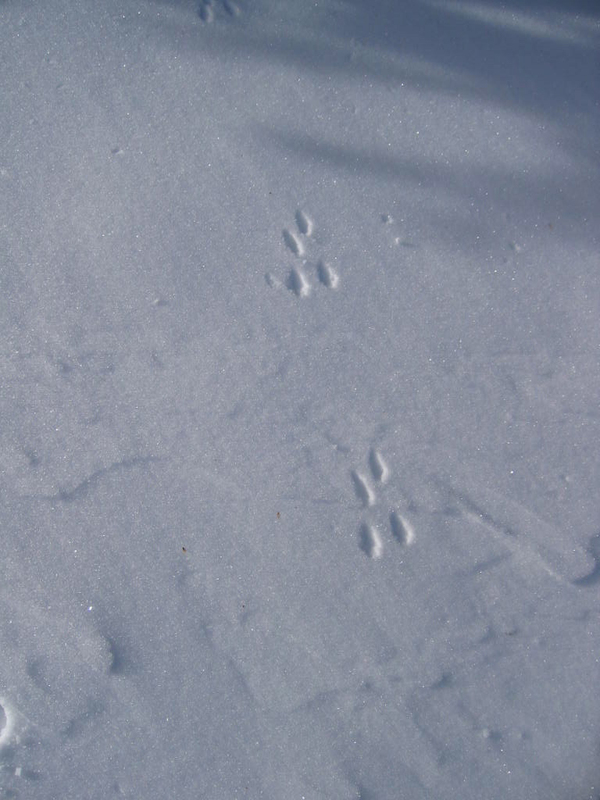 Well, I just found this website, and Megan beat me to it, but I agree that these are the tracks of a snowshoe hare. I once lived in Colorado near Steamboat Springs. Very clever Jo. I laughed out loud, spewing my organic Tulsi Gotu Ginger tea all over my monitor. Make the dark chocolate fudge, it’s faster. And enter the tracking contest, while you’re at it. You might actually win. So far, Megan’s in the lead (Michael’s a close second), but that’s for the consolation prize because the tracks are not from a snowshoe hare. I have a top official at the Colorado Division of Wildlife reviewing things right now. We’ll know his final answer soon. Are those tracks from a pine marten? That’s actually my husbands’ guess, I initially thought that it was a cottontail rabbit. I’m not sure that cottontail rabbits are at that altitude. I found your blog last week and have been enjoying going back and reading your posts. We are your neighbors just north of Golden. Hi Janine — I’ll let you know in a few days. You’re north of Golden? Where? And what brought you to my blog? Are you gluten-intolerant? Oops, sorry for all the questions! Thanks for stopping by. I’ll let you know about the tracks soon. I’m giving it a week, then I’ll divulge who this little critter was. Take care!